Stripping traditionally started with individuals using buffers and ammonia based non-chemical strippers. 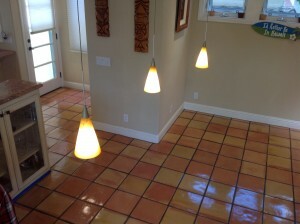 This way of stripping floors is great for linoleum and great for removing wax or floor polish. If you tried the above methods on tile and grout you would only be able to get off some of the existing finish. 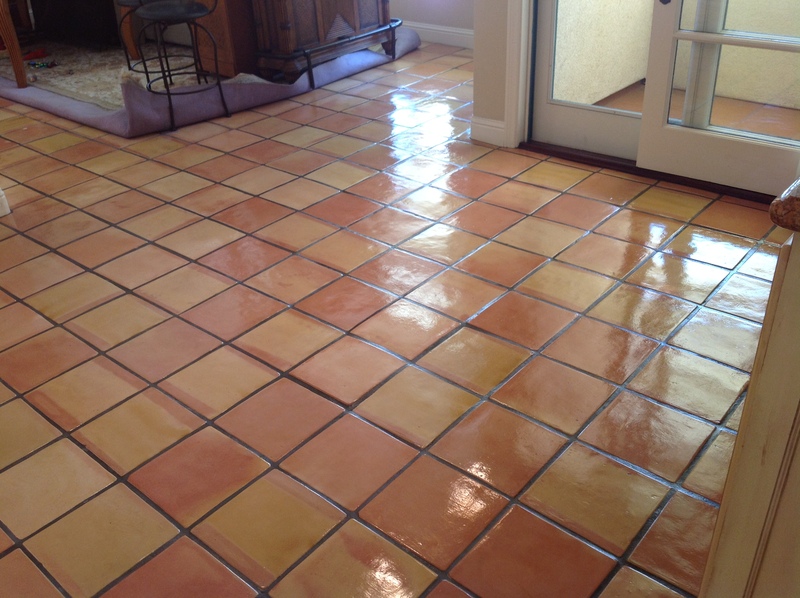 There have been many companies or individuals that I have had to rescue on a job where they couldn’t get all of the old finish and or stain off the tile and grout. We separate ourselves from the competition, because we can get all the old finish all the way off the tile and grout by using the proper stripper which penetrates the Tecate, Saltillo, Lincoln, Barcelona, Mesquite pavers as well as slate and flagstone and turns the old finish back into a liquid so that it can be scrubbed off and then wiped up. 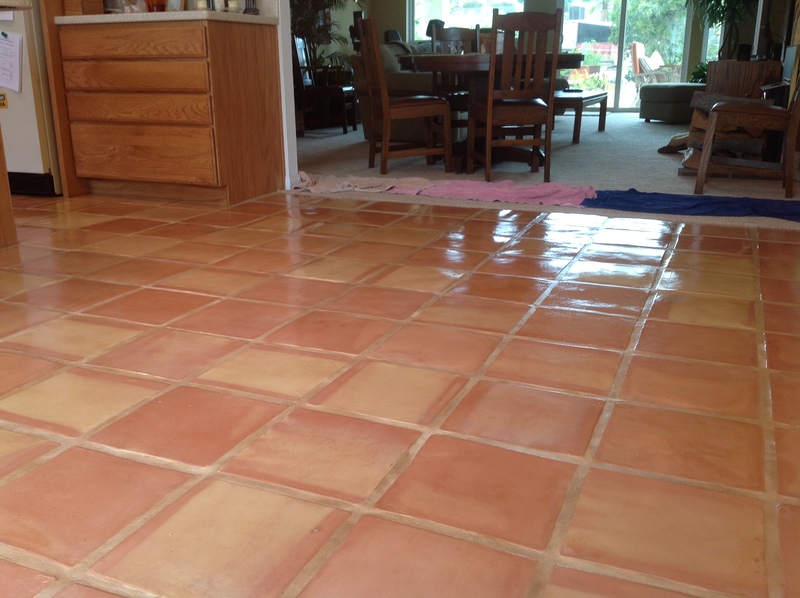 We call the stripper we use, “Secret Sauce” an old family recipe, , its the only true way to get sealer wax and stain completely off the tile and grout. Saltillo Mexican Tile Pavers are usually sealed with topical sealer or surface coating upon installation. This protective coating wears out without periodic maintenance. When the coating deteriorates and begins to crack and chip, it loses its ability to repel stains, oils, dirt, and other contaminates. Soon thereafter the pavers become a candidate for refinishing. Stripping is done using a solvent suitable for the removal of the specific type of sealer on the pavers. It is here that Mexican Paver Restoration and Refinishing’s expertise and experience comes into play, each job is different, but the same, all work is done on hands and knees, no machines are used on pavers due to the clay tile’s softness, machines lack of detail, getting the sealer out of the grout, behind toilets, underneath cabinets, corners and hard to reach places. The solvent based stripper (which is how you remove sealer) is a much better tile stripper. water based strippers will only get off some of the sealer not all of it. This will give you problems when you reseal it. If not immediately, it will happen down the road since it does not have a true bond where those areas where sealer was not completely removed. I only use water based strippers to remove wax or floor polish which is different from sealer stripping, (see wax stripping for details). Once the pavers have been stripped and detailed, they are ready to be resealed applying multiple coats to achieve a desired seal and consistent shine throughout the pavers and grout. Now we apply the floor polish to the entire floor and grout and at this point we call it bullet proofing the floor (remember floor polish is useless unless the pavers were sealed properly, because it sits on top of the sealer and will sink in if the pavers are not sealed correctly, remember the floor polish protects the sealer and the sealer protects the paver and the grout). 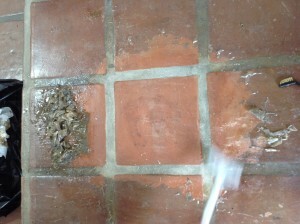 Get Your Mexican Tile Floor Stripped ASAP before it’s beyond repair! California Tile Restoration strips all ceramic tile mexican pavers in multiple cities and counties such as San Rafael, Concord, San Francisco, Dixon, Davis, Marin County, Napa County, Sacramento, Auburn, Folsom, Roseville, Elk Grove, Belvedere, Tiburon, Greenbrae. Fairfax, Lucas Valley, Inverness, Visalia, Modesto, San Diego, Los Angeles, Mountainview, Monterey Bay, Santa Cruz, San Jose, Santa Clara, Walnut Creek, Danville, and we travel many more ares throught the west coast.